First, we suggest you assign a specific place to work. This doesn’t have to be a whole separate room or office, but we recommend that the space be as clear of distractions as possible, with all educational material readily accessible. If you are using a space that has a dual purpose (a kitchen or dining room table), have your child sit in a different spot. This will get them in the mindset of work, instead of eating or playing. As an extra bonus option, let them sit in Mom or Dad’s “spot”; they can only sit there during work time, and no other family member can sit in that spot ever! Another bonus: get your kiddo a fun water cup and straw that they use only during school time! Second, to help reduce the possibility of meltdowns?? ?, disclose all expectations at the beginning of work time. Let your child know exactly what must be completed for the day, or even the week. This will give your child a predictable ending point, and a sense of accomplishment when it is completed. 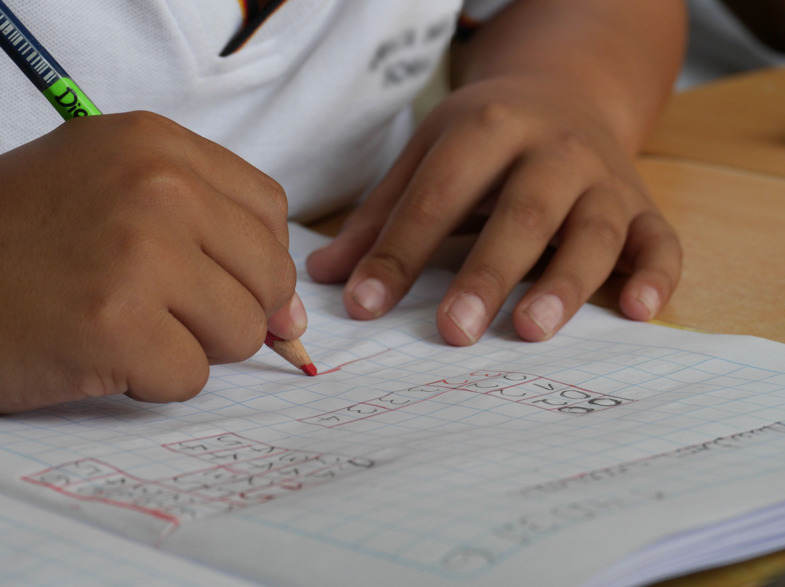 This recommendation comes with a stipulation – some kids become overwhelmed when they perceive a large amount of work that they need to complete. If you find this to be true, you can make a few modifications. One, let them know which subjects will be covered that day; and/or two, cut or fold long worksheets so the child only sees a few items. Let them take breaks as needed. Third, as best you can, tailor the material to your child’s interests. The great thing about educating your child at home is the option to tailor the teaching approach to your child’s specific needs. If your child likes cars, find multiplication worksheets that feature cars, or have them complete a sentence sheet for their sight words using car sentences. Sometimes a quick Google search can reveal some great free resources! You can also contact Inspire teachers to see what they have available. Yes, your child will have some material that they need to complete that they won’t enjoy; but if it’s possible, we want learning to be fun! Fourth, reward your child! Everyone likes to be acknowledged for their effort and the work that they do. It doesn’t need to be something big – even a high five or hug can do the trick. Other options could be to speak positively to other family members or friends about the work your child has completed, hang their work up on the fridge, or allow time on electronics or other games. Stay tuned for an upcoming blog post on free/cheap at-home rewards! Fifth, realize and accept the hard days. We all have hard days; days that you don’t want to get out of bed or do your work – kids have these days too. If you can tell that your child isn’t having a great day, or they seem more emotional or distracted, acknowledge that it may not be the most fruitful day. Your child’s body and mind are constantly growing, so you may need to adjust some of your expectations for the day or week to help them meet their educational goals. And finally, have some fun! Get outside to do your science projects. Learn math facts through songs. Show your child how and where adults are working. Let them out into the world as much as possible. This is the biggest perk of school at home – you are able to spend more quality time with your child, and open the world to them!